Three years ago my family took a trip to Fort Wayne, Indiana. We thought we would listen to some good music, hear some interesting speakers, meet some new people, and then head home. We had no idea that it would be the birth of long-lasting, life-giving friendships. We were all excited and a little nervous about a this new adventure called the Lion and Lamb Festival. Rachel Held Evans, whose book had just moved me to multiple tears, laughs, and thoughts, was the keynote speaker. I was preparing to be a speaker myself, the first time I had ever been in a “program” outside a church. It was an exciting time, and I had no idea what to expect. The first Lion and Lamb Festival was attended by a couple hundred people. It wasn’t a huge event, but I had no idea the kind of impact it would have on my life. With the advantage of hindsight, I now see that first weekend in Fort Wayne as one of the more significant events of my life. In 2013 my blog was starting to gain new traction. A couple of viral posts, and the a RT by Rachel Held Evans herself had given me a platform I had not expected when I started this blog in 2008. At the same time, I was an associate pastor. I was happy with the work I was doing and enjoyed the extra family time the position allowed, but not preaching every week was hurting me. I was struggling with finding my own voice and mourned the loss of being able to cast a vision for a church. My blog and a new podcast called Pulpit Fiction became creative outlets that fed my spirit and my intellect. At the Festival I was able not just meet Rachel Held Evans, but sit down and talk to her about blogging, writing, travel, and football. I got to know her a little, and learn from her. I met musicians, and connected with amazing talented people like Heatherlyn and Amy Cox who have since come to my home to share their music with my friends and family. My own family met another family with two daughters at similar ages. Despite meeting at a place hundreds of miles from both of our homes, we have since gotten together several more times. Now, two years later, The Lion and Lamb Festival is coming to Illinois. Last year I started as a pastor of a church that owns a campground. The first thing I thought when I saw the camp was, “I wonder if we could do Lion and Lamb here.” For the last year we’ve been planning, gathering partners, searching for funding, contacting musicians, artists, and activists. I have shared the vision that was cast from Fort Wayne years ago. This weekend it will take shape at Camp Milan Retreat Center. We have an amazing day planned. Musicians, artists, and speakers are coming to share their stories and their songs. I don’t know who is going to come, but I’ve been praying about this day for a long time now. I’m praying that more relationships will be built. More people will be inspired by stories of justice. More people will be motivated by the power of music. More people will be know God’s love that is active in the world. A mother started to play with second-hand dolls on a lark. She wasn’t trying to make a statement. 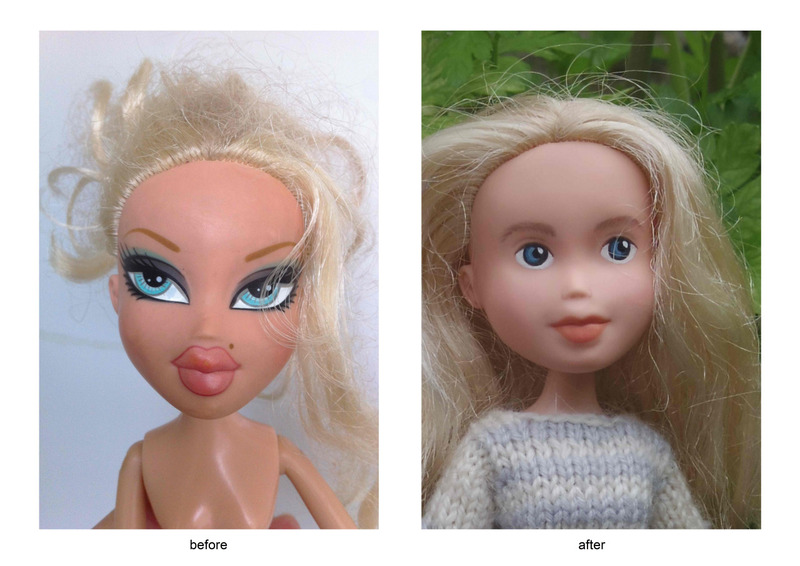 She just wanted to create a doll that had a more natural look. Then the internet happened. From what I can tell, this whole thing started in January 2015. As of right now, just four months later, the Tree Change Doll Facebook page has over 300,000 likes. The before and after pictures are remarkable. A little nail polish remover, a steady painting hand, and some hand made clothes have created a movement. Mascot Bracket 2015 is a new game. We’re going “Battle Royal” style. Each site in the tournament will be a separate four-team battle. Throw them all in the ring, and see which mascot emerges. A couple ground rules, this year we’re going with pure Mascots. I gather as much information as I can about the mascot from their logo or the actual running-around guy in the costume. I’m taking everything that the mascot has on its person at face value. All weapons are allowed, but only if they are depicted with a weapon in official logos. Omaha Battle: Wisconsin Badger, Coastal Carolina Chanticleers, Oregon Ducks, Oklahoma State Cowboys. This battle can be renamed, “Target Practice.” Two birds and a badger would be no match for the gun-toting cowboy. Jacksonville Battle: Arkansas Razorbacks, Wofford Terriers, North Carolina Tar Heels, Harvard Crimson. A very interesting battle between three animals and a color. The color in the past has always meant certain doom, but since I’ve switched to mascots instead of nicknames, Harvard has a chance. The only problem, I cannot seem to find any mascot or logo for Harvard that isn’t just an H on a red shield. Wofford’s entry of a cute little Boston terrier probably wouldn’t last long. While the North Carolina nickname has roots in the Civil War, they now use a ram as a mascot. Wild boars are some of the most fearsome fighters in the animal kingdom. Rams pack an impressive amount of power, as seen in this National Geographic video. This seems like a toss-up, but I’ll lean lightly toward the Razorback because of the sharpness of those teeth. Hakunamatata. 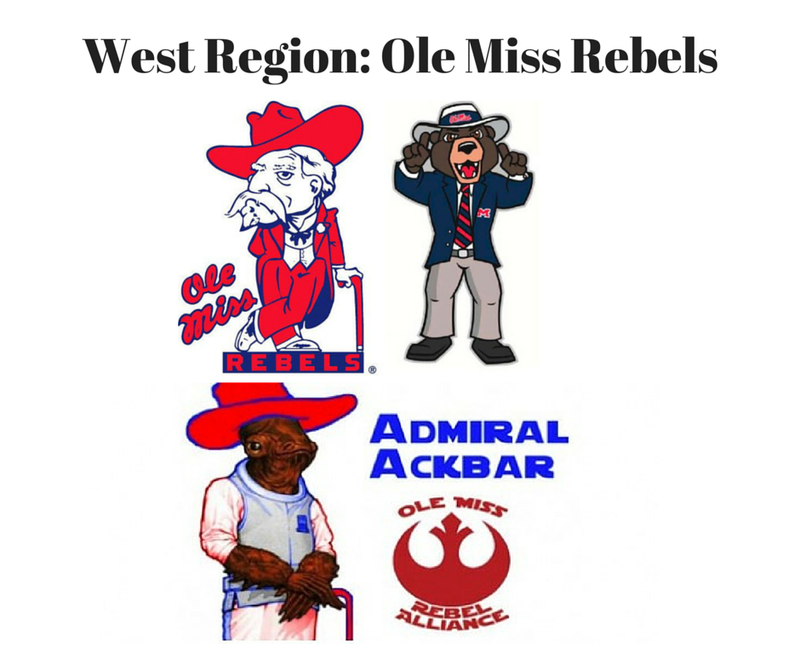 Ole Miss ditched the plantation owner in favor of the preppy bear, thus missing a golden opportunity to have the greatest mascot ever. Jacksonville Battle 2: Xavier Musketeers, Ole Miss Rebels, Baylor Bears, Georgia State Panthers. Colonel Reb, the old man leaning on his cane, was over ten years ago. In 2010, there was a contest to choose a new mascot. 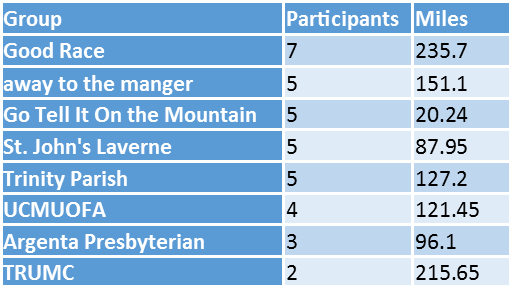 Some believe the rightful winner of the contest was none other than the trap-recognizing Admiral Ackbar. If they had, they would be the odds-on favorites to win this thing. The school however, adopted Rebel Black Bear as their official mascot. This leaves us with two bears, a panther, and a guy with a sword. I don’t see the sword-yielding musketeer getting very far in this battle, so I’m invoking the higher-seed rule. Plus, I think the suit coat and tie would limit Reb’s mobility in a fight. Portland Battle: VCU Rams, Ohio State Buckeyes, Arizona Wildcats, Texas Southern Tigers. Another interesting battle between three animals and a Brutus. 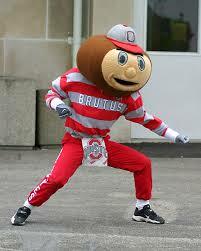 In the past, the Ohio State Buckeyes never stood a chance. The plant always lost to everything. This year though, I’m using the mascot instead. They have a fighting chance. Brutus is basically a human with a huge head. With no visible weapon, he hardly seems like a formidable foe. This battle comes down to ram versus tiger. Another tough choice, but I think the tiger would stand down against the power of the charging ram. Check out the Mascot Bracket Final Four. 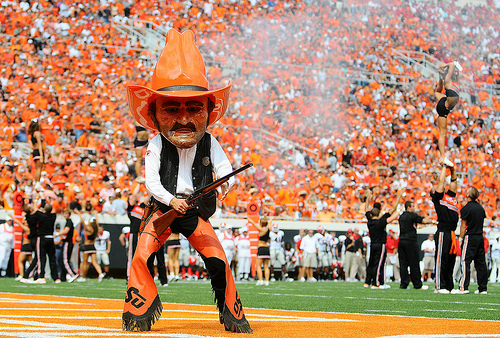 The OK State Cowboy has a high creepiness factor with the regular body and the plastic head, but it’s that piece he’s carrying that puts him into the Final Four. Louisville Battle: Kentucky Wildcat, Hampton Pirate, Cincinnati Bearcat, Purdue Boilermaker. The Pirate and the Boilermaker are humans with weapons, and neither the wildcat nor the bearcat are particularly formidable in a fight to the death. Really, this comes down to the big guy with a big hammer versus a pirate with a sword. This is a tough battle, and I’m not sure how it would go down. 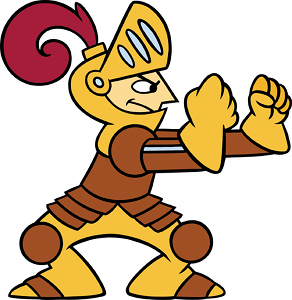 I’m giving it to Purdue Pete though, because the Pirate has a tough blind-side. Columbus Battle: West Virginia Mountaineer, Buffalo Bull, Maryland Terrapin, Valparaiso Crusader. This is a tough group, but I don’t think that the big turtle would last very long. So we have a buffalo, an armored knight, and a guy in buckskin with a huge gun. At first glance, this seems like a clear example of a man with superior weapons beating the animal and the other guy. The buffalo however, is a pretty formidable opponent. This is where I wish I knew more about guns. All I know about the Mountaineer’s gun is that it is big. Really big. According to this article, it is enough gun to take down a black bear, so my only question is if he could reload and fire quick enough for it to be useful in the closed-quarters of the Mascot Bracket battle ring. Depending on which logo you look at, the Crusader does not appear to be armed with anything more than either a shield or his own dukes. 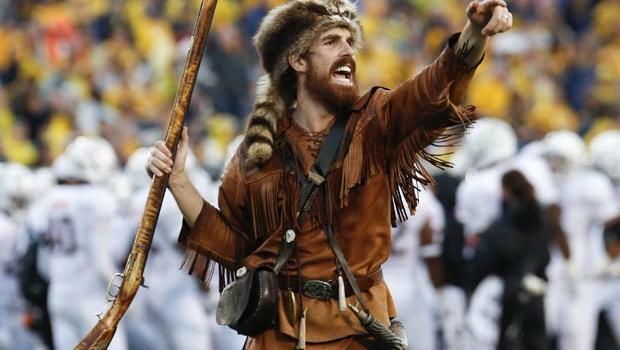 I don’t think that shield is stopping any firepower, and armor or no, I’m picking the Mountaineer over this guy in closed-quarter combat. Pittsburgh Battle: Butler Bulldogs, Texas Longhorns, Notre Dame Fighting Irish, Northeastern Huskies. Three animals and a belligerent Irishman. 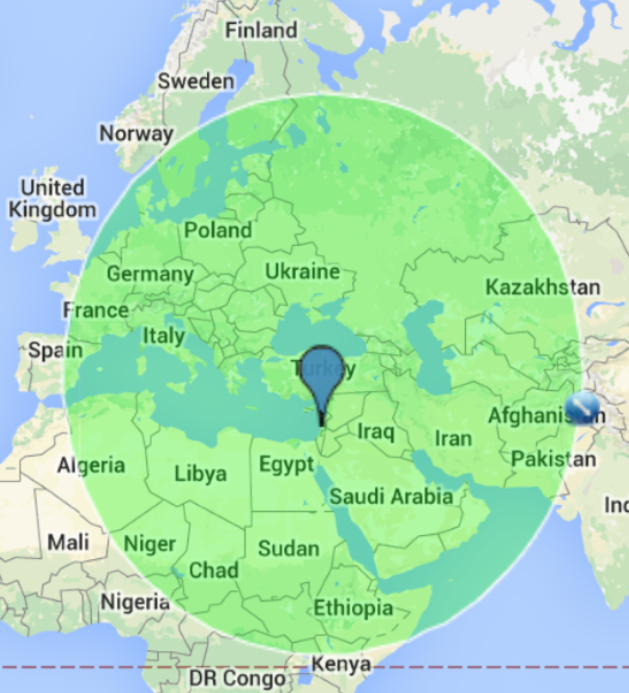 If this battle was taking place on March 17, I’d probably give it to the Irish. A Longhorn however, would be pretty tough to bring down. No matter how much Guinness-fueled strength was available. The most interesting battle of the region. Omaha Battle: Wichita State Shockers, Indiana Hoosiers, Kansas Jayhawks, New Mexico State Aggies. This is one a tough call. We have the Lady Elaines, Ron Swansons, Foghorn Legorns, and this thing. Actually, Indiana doesn’t have a mascot or any logo beyond the IU symbol. Howie Hoosier continues to fight the good fight to be named as Indiana’s mascot, but at 127 likes on Facebook, there’s not exactly a groundswell of support. The Hoosiers are out. The Jayhawk is fried chicken after one shot. In the end, I believe that whatever dark magic that is animating the shock of wheat cannot be beaten with a simple gun shot, not matter how formidable the mustache. 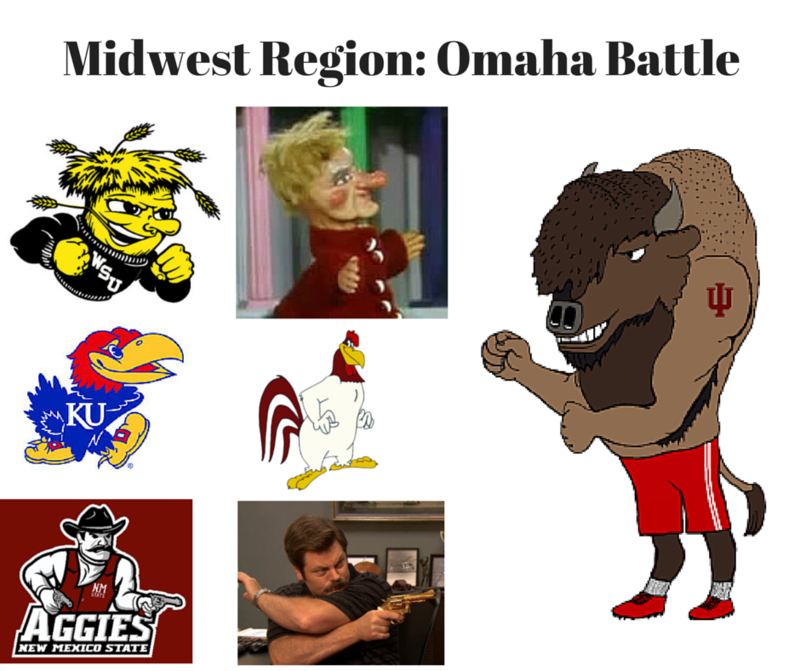 Cleveland Battle: In the battle for the Final Four, we have the Boilermaker (man with hammer) Mountaineer (man with gun), Longhorn (big animal with horns), and the Shocker (magical wheat-creature). So here’s how it plays out: the Longhorn tramples the shock of wheat. A bullet might not hurt it, but a thousand pounds of hoofs would. The Mountaineer is able to take out the guy with a hammer, then has time to reload as the Longhorn plays in the hay. West Virginia makes it to the Final Four. The trophies on this hunting trip include a Buffalo, a Longhorn, and a guy with a hammer. Yertle the Turtle was a king. He was the king over all he saw, but he was dissatisfied. He wanted a bigger kingdom, so he decided he needed a higher throne. From the higher throne, he would be able to see farther, and rule over more territory. To satisfy his need for a higher throne, he order a few turtles to be stacked upon each other. From atop this throne of turtles, he could expand his kingdom. Over the course of increasing his reign an insignificant turtle on the bottom of the throne named Mack asked for some relief. He was granted none. Higher and higher the turtles were stacked, and yet Yertle was never satisfied. Eyeing his vast empire, he noted he wasn’t the highest creature in the sky. Perturbed by the presence of the moon, her ordered a thousand more turtles for his thone. All the while poor Mack on the bottom of the stack was aching with a sore back. Finally, Mack cracked. Actually, he burped. And the tower of turtles came toppling down. Yertle fell into a puddle of mud, where he reigned all that he could see, which wasn’t very far. 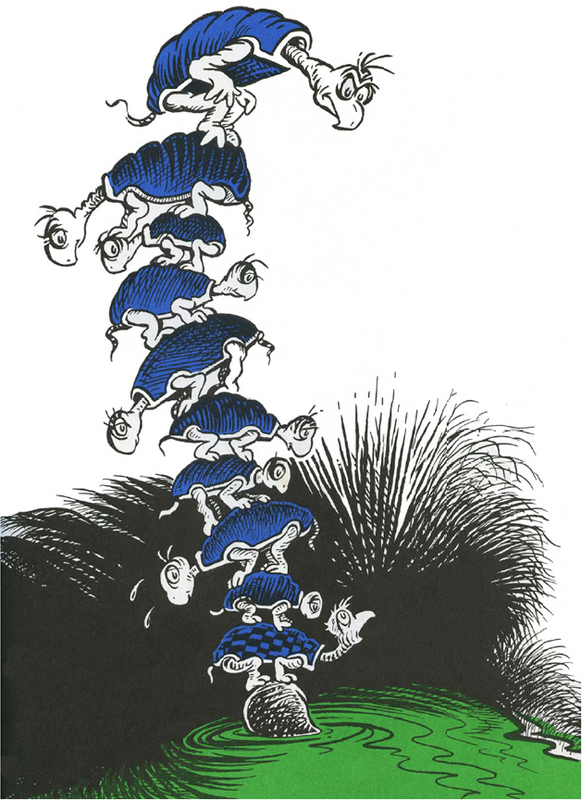 Yertle understood the power of a kingdom. He understood only one thing that matters: more. More turtles, more land, more power. He didn’t care how he achieved more, and he paid no heed to some poor turtle named Mack. Jesus lived in a time when the power of kingship was clear. The stack of turtles under the King was high indeed. So high that the King named Caesar called himself the son of God. All the people that gathered on that mountain understood that kind of kingdom. They understood what it felt like to be on the bottom of the stack. It was a crowd of Macks that gathered that day. Jesus declared that the Kingdom of God was at hand, and in the Kingdom of God, even the burp of a lowly turtle on the bottom of the pile matters. Today is National Epilepsy Awareness Day, and a little bit of knowledge could save someone’s life. I’m wearing purple, and found this blog when I followed the #PurpleDay. Vulgarity warning – but a very good read.